Hanoi (VNA) – A conference on Vietnam-Middle East business cooperation was held in Hanoi on August 28, drawing more than 40 leading Vietnamese export firms. Addressing the event, Minister of Agriculture and Rural Development Nguyen Xuan Cuong said that the Middle East is a huge market and a gateway to the European market. Vietnam eyes high hope for exporting many agricultural products, including rice, tea, coffee, peppercorn, rubber, cashew, fruit, aquaculture products, to the 400-million market of Middle East with 16 countries. However, Cuong pointed out that trade revenue between the two countries remains low due to difficulties in payment as the two sides mostly pay via intermediary banks in Dubai, China and Singapore or some European countries with high cost. Vo Quang Huy, Director of Huy Long An company, said that the Middle East is a promising market for Vietnamese bananas. He asked for more effective measures to support exporters in payment as well as building standards for goods exported to the market. Le Thanh, head of the Organic Agriculture Institute, asserted that vegetable export growth to the Middle East is high at 24 percent, which shows that this is a promising land for Vietnamese firms. 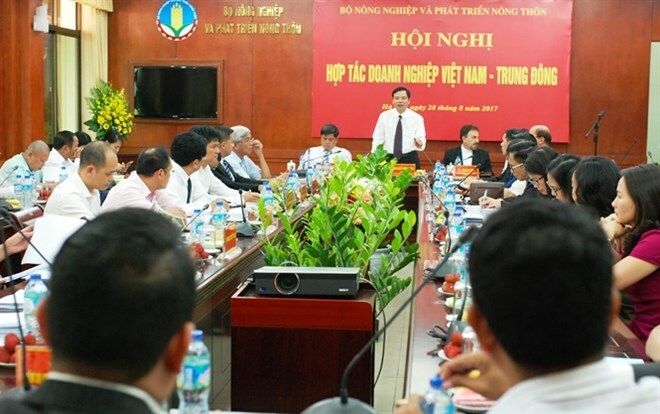 However, logistics and payment have hindered Vietnam’s exports, he said, suggesting cooperation among firms. Meanwhile, Tran Van Tri, Chairman of the Vietnam-Iran Business Council, proposed that the Government should speed up banking cooperation to facilitate payment between the two countries, along with preferential policies in tax. Saleh Adibi, Iranian Ambassador in Vietnam, said that the major obstacle hindering bilateral cooperation is banking. He suggested that Vietnamese firms can use Iran’s banks as Iran is linking with many banks around the world. He said he hopes Vietnam and Iran will soon sign a preferential trade agreement.